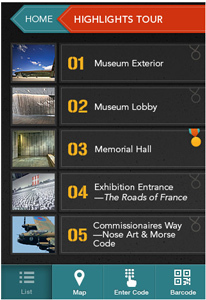 The Canadian War Museum has launched a free mobile application that invites iPhone, iPod Touch and iPad users anywhere in the world on an interactive tour of over two dozen of the Museum’s most notable features and artifacts. Owners of these popular handheld devices can use the mobile application to obtain one-stop access to information about the Canadian War Museum from anywhere in the world. The tour showcases 28 Museum features and artifacts, including objects that bring to life some of the monumental events in Canada’s military history. Each stop includes images and a short audio commentary. Visitors can also take a fun quiz to test their newly-acquired knowledge. The application also provides all the information needed to plan a visit to the War Museum, including interactive floor maps and information about hours of operation, admission fees and public services. Visitors can now use their mobile devices to learn more about key areas such as Memorial Hall and Regeneration Hall, as well as important artifacts like Major General Isaac Brock’s tunic and the collection of pictures painted on the front of Second World War aircraft, also known as “Nose Art”. The application was developed by the War Museum with the assistance of Tristan Interactive, a Canadian company specializing in multimedia tours using mobile technologies. “We are proud that the Museum chose Tristan’s state-of-the-art technology to help their visitors better understand Canada’s past,” stated Chris McLaren, CEO of Tristan Interactive. This entry was posted on Wednesday, November 9th, 2011 at 8:47 am and is filed under Digital Products, Education, National News. You can follow any responses to this entry through the RSS 2.0 feed. You can leave a response, or trackback from your own site.